In a musical career spanning over thirty years Chris has performed or recorded with Paul Simon, Janet Jackson, Julia Darling, David Johansen, William Hart Strecker, Gladys Knight, Ron Carter, Lou Rawls, Slo Leak, Rene Lopez, The Annapolis Symphony, Hubert Sumlin, Stuff Two, Keith Urban, The Hudson River Rats, Dave Keyes, Martha Reeves, and countless other unsung but gifted heroes in dives, blues bars, Carnegie Hall, a Presidential Inaugural, the streets of Baltimore, and other places across the globe. Chris has also performed as a featured on-stage soloist in several Broadway shows including Riverdance, Movin’ Out, and the Grammy-award winning Smokey Joe’s Café. 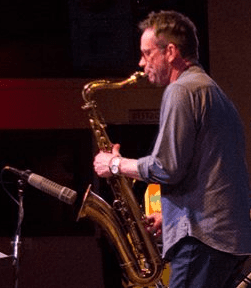 In addition to being a versatile and seasoned saxophonist, he also plays several other woodwinds, guitar, keyboards, harmonica and other things. Chris played saxophones, ethnic flutes, hand percussion, and harmonica on several National Geographic and Discovery television specials, and has recorded for commercial clients AT&T, Arby’s, Nextel, eBay, Cheerios, and others. His sax playing can be heard on the soundtrack for the movie “Taxi” and he can be seen (for a second) in the movie “Mona Lisa Smile”. He attended Peabody Conservatory as a Music Education major and received a bachelor’s degree in Jazz and Commercial Music from Manhattan School of Music. He runs Woodshed Music in Patterson, NY where great attention is paid to make things that sound good. His 2009 solo release, “Twice The Animal” is available on iTunes,and CDbaby. Oprah, Inside Edition, American Idol Rewind, Cities Of The Underworld, Feed The Children, Bad Girl’s Club, Entertainment Tonight, Martha Stewart, The Food Network, NBC Sports, What On Earth?, Bringing Home Baby, My First Home, E! News Live,Property Ladder, Dr. 90210, Dr. Oz, Toddlers and Tiaras, and many others. Chris’ original song “Home Again” written with Dave Keyes was featured in the movie “The Last Run” directed by Jonathan Segal.